Some 690 people were executed in 20 countries last year, excluding China, a fall of 31% on 2017 - when 993 deaths were recorded. What does Amnesty's report say? Amnesty's review of the use of the death penalty, which was released on Wednesday, says that while the number of executions have fallen in some countries, several others have seen a rise, including the US, Japan, Singapore, South Sudan and Belarus. "The dramatic global fall in executions proves that even the most unlikely countries are starting to change their ways and realise the death penalty is not the answer," Amnesty's secretary general, Kumi Naidoo, said. "This is a hopeful indication that it's only a matter of time before this cruel punishment is consigned to history, where it belongs." 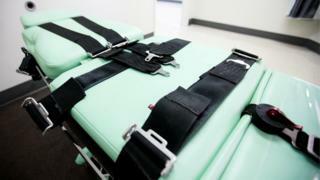 Have any countries reinstated the death penalty? Yes. Last year Thailand carried out its first execution since 2009, Amnesty found, while earlier this year Sri Lanka began a search for executioners as part of a crackdown on drug smuggling. "These countries now form a dwindling minority," Mr Naidoo said, adding: "To all the countries that still resort to the death penalty, I challenge you to act boldly and put a stop to this abhorrent punishment now." Death penalty: How many countries still have it?